… John Lewis Finance, M&S Bank and Atom Bank among the losers. March has been a busy month here at Smart Money People! We’ve gone live with our 2017 360° product ratings. We’ve launched these ratings to make the financial services industry more transparent, and to help consumers make more informed decisions. What is Smart Money People 360°? 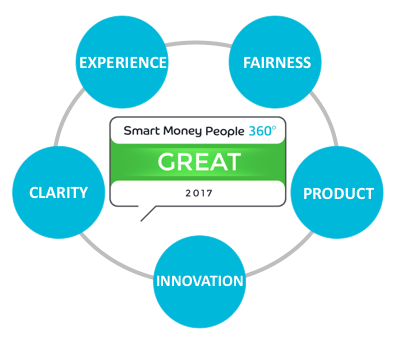 Smart Money People 360° is the only financial services product rating to review a proposition based on a combination of customer feedback and product analysis, a truly 360° approach. To create each overall rating, a product is scored against 5 individual scores for the following elements: Fairness, Experience, Clarity, Product and Innovation. These are then combined to create an overall Smart Money People 360° rating. Who was good enough to receive a GREAT rating? There were only 4 organisations that were good enough to receive a GREAT rating: first direct, Halifax, Nationwide and Virgin Money. first direct received a GREAT rating for both its 1st Account and its Savings proposition. We love their £250 interest free overdraft and the option for customers to ‘sweep’ any spare money in their account into a savings account just before pay day. first direct’s savings customers also have a lot of positive things to say about them, first direct unsurprisingly received a GREAT savings customer experience score. Halifax received a GREAT rating for their Reward Current Account and their Mortgage proposition. Customers can receive £3 a month paid into their Reward Current Account as long as they pay in £750 a month, in addition they also have access to a £50 fee free overdraft and all for no monthly fee. Halifax Mortgages received the highest Fairness score amongst the providers that were rated. Nationwide on the other hand received GREAT ratings for their Savings proposition and the Nationwide Credit Card. Nationwide reward their credit card customers with commission free international spending on a 5:1 ratio. They also e-mail their savings customers to tell them about any new products that they are launching. The final provider to receive a GREAT rating was Virgin Money for their Mortgage proposition. Virgin Money received the highest Experience score based on data provided to us by our consumer review community. Who takes home a POOR or BAD rating… and why? Two well established high street retailers (all be it with HSBC helping their banking operations) have received below average rating. M&S Bank received a POOR rating for their current account, with customers not happy about long call wait times and poor fulfilment of voucher. John Lewis Finance, the only provider to receive a BAD rating, received this rating for their Partnership Card. Back in October 2016 a significant number of customers experienced a litany of problems as part of their rebrand and website redevelopment (we summarised it here). Two new savings providers received a POOR rating for their savings proposition. Atom Bank users experienced technical problems getting their mobile app to work, which impacted this new banks overall score. Charter Savings Bank was the other provider who received a below average POOR rating. Unlike Atom Bank, the key bug bearer was customer service. Two high street banks also received a POOR rating within the Business Banking category, HSBC and Lloyds Bank. The Business Banking category typically receives lower than average scores when compared to other banking products, with the highest scoring provider (Barclays) just receiving an OK rating. If you want to find out more about our ratings you can download a brief overview of how our product ratings are created (by using the form below) and to see the full list of banking products that have received a rating.